This is the twenty-eighth in a series of posts that report on the state of the parties as measured by opinion polls. By pooling together all the available polling evidence we can reduce the impact of the random variation each individual survey inevitably produces. Most of the short term advances and setbacks in party polling fortunes are nothing more than random noise; the underlying trends – in which we are interested and which best assess the parties’ standings – are relatively stable and little influenced by day-to-day events. If there can ever be a definitive assessment of the parties’ standings, this is it. Further details of the method we use to build our estimates of public opinion can be found here. In recent years politicians have often been criticised, often with some cause, for being out of touch. But the journalists who are so eager to level this charge may want to examine their own views, and where they come from. Like politicians, national media journalists form a small, tight knit community who talk (and Tweet) to each other much more often than talking to the people whose views they claim to represent. This can cause problems when the judgements of other political professionals are out of kilter with the reactions of the average voter. At least politicians have constituency surgeries to reconnect with the voters. How often does the average Westminster lobby journalist sit in on one of those? The shortcomings of “Westminster Village” groupthink have been amply on display this summer , The prevailing narrative of the summer was that Labour was divided and weakly led, and that this was harming them with the voters, a judgement which had little basis in the polling evidence. The Syrian crisis has produced a new rush to judgement in the Village, with journalists of differing political persuasions declaring it a death blow for David Cameron, Ed Miliband or both. But in reality it has not changed the political weather outside Westminster much, nor is it likely to. Most voters were against the Syrian intervention, and therefore happy that it is not proceeding. The average voter packing up her barbeque and preparing her kids for the new school year knows little, and cares less, about the obtuse arguments about motions, amendments and Parliamentary authority which have so excited the Villagers. Their judgement about the two leaders’ apparently disastrous performances has been an indifferent shrug of the shoulders. In the latest figures from the Polling Observatory, we have seen virtually no change since the start of August. UKIP gained no political advantage from their widely trailed opposition to the war: their support is flat at 11.7% (no change). So too has support for the Liberal Democrats remained stagnant, standing at 8.4% (no change), bumping along at a level that has remained stable for more than two years now. In contrast to the main other parties, this inertia must surely start to concern the higher echelons of the Liberal Democrats, as voters seem to have made up their minds on the junior coalition partners, and largely do not like what they see. Our figures for the main parties show a small movement, but hardly enough to justify the many column inches. In the last month, Labour have seen a marginal decline in their support, down 0.4 percentage points at 37.7%. 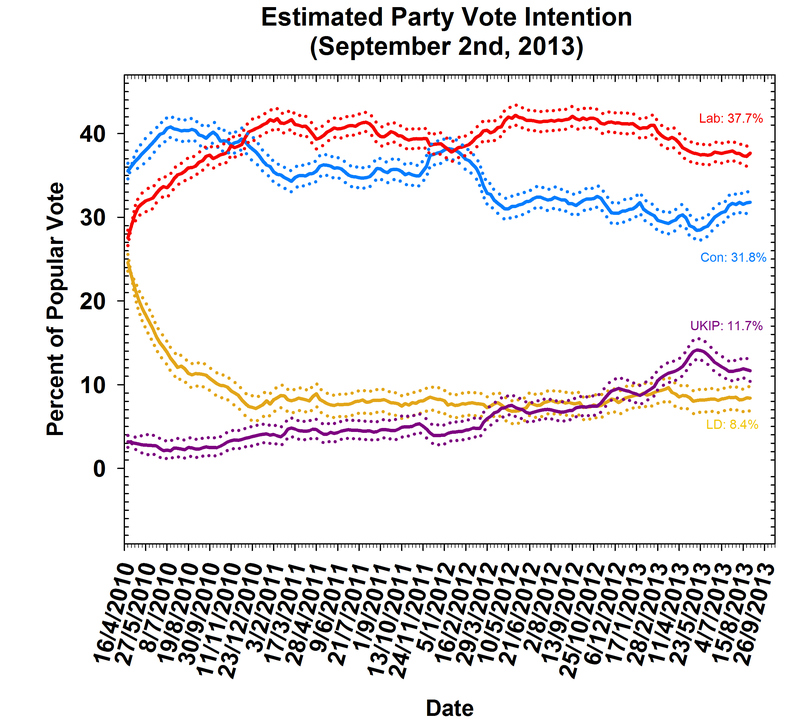 The Conservatives have seen a slight rise, up 0.6 points at 31.8%. Labour thus retain a healthy lead which, given the advantages handed to the party by Britain’s electoral system, would likely be enough to deliver a comfortable Parliamentary majority. The Westminster Village pathology will be particularly evident as the election draws nearer. As an election approaches, journalists tend to veer between regarding the outcome as completely certain and completely unpredictable (often depending on how the polls relate to their own preferences). The trouble is that journalists, like all people, find it very hard to make judgements about uncertain outcomes. People don’t like uncertainty, and struggle with even the most basic probability ideas (the success of lotteries and casinos is proof of this). Often what emerges to help them cope are “rules of thumb”, often based on over-simplified or half-remembered insights from research, or powerful but anecdotal past experiences. One such rule of thumb is to try and tie the coming election to some past election. Conservatives like to look forward to 2015 as a re-run of 1992, when they won a majority after trailing in the polls for years because (in their view) the public was not willing to back a weak Labour leader. This neat analogy tends to gloss over the 1990 defenestration of Margaret Thatcher, which enabled the party to replace one very unpopular leader with a much more popular one, erasing their poll deficit in the process. It also overlooks the inconvenient fact, rather relevant for the current context, that the Conservative vote share in 1992 was lower than in 1987. It will be very hard for David Cameron to become PM in 2015 on a lower share than 2010, and even harder for his party to win a majority. A popular analogue on the left and among UKIP-worriers on the Conservative right is the 1983 general election, when the left divided between the SDP and Labour, enabling Margaret Thatcher to win re-election in a harsh economic climate. Many pundits think a right divided between UKIP and the Conservatives will similarly let Miliband’s Labour in through the middle. Left out of this story is the role of the Falklands War, the fact that the SDP drew a lot of support from moderate Conservatives, and that UKIP is most popular with white working class voters who might be more electorally important for Labour than the Tories. Another piece of folk wisdom is encapsulated in the immortal slogan coined by Clinton campaign manager James Carville: “It’s the economy stupid!”. If the economy is growing, the rule of thumb says, the government will be re-elected. The political science research shows there is some sense in this: government do perform better when the economy does well, as we might expect. But research also shows that the link between the economy and the vote is complicated: green shoots do not always guarantee re-election, dark clouds do not always presage defeat. In 1997 Britain’s economy was growing under the Major government, but Labour was still elected in a landslide. This time round the economic context is hard to read. Voters are experiencing a squeeze on living standards, and there are concerns that the nascent recovery is being fuelled by credit – leading commentator Ann Pettifor to call it an ‘Alice in Wongaland’ recovery. It is simply too early to tell, then, whether our pocketbook theories of voting will predict the election winner in 2015. A third rule of thumb tells us “never mind the polls, just look at the leader ratings”. As with the economy, there is some sense in this: the research shows leaders do make a difference. But, as with the economy, it is a misleading simplification to argue that the leaders are all that matters. In 1979, for example, voters strongly preferred the affable James Callaghan to the combative Mrs Thatcher. That did not save the Labour government. In the current Australian federal election, polls have consistently shown the incumbent Kevin Rudd preferred as PM to Tony Abbott, only to be overtaken in the final week of the campaign, with the government on course for a substantial rout. Context is important here too. Miliband clearly has poor ratings by historical standards. But the negatives of all party leaders today are substantial, more than historically has been the case. There is a prevailing “sod the lot” sentiment around, with many voters taking a dim view of all the leaders. Those who focus on Ed Miliband’s leadership ratings as evidence of his impending defeat might want to think about why voters who rate the other leaders just as poorly will be so keen to switch away from him. Finally, another rule of thumb suggests that voters will punish Labour for lacking a clear message about what it would do if elected to power. After all, how can the public be persuaded to vote for the party if they don’t know what its policies are? Certainly the polling evidence suggests that people are unsure what Labour stands for as it rebuilds from thirteen years in government. While Labour’s tactic of keeping their policy cards close to their chest might not be good news in the newsrooms of the Westminster Village, it may not be bad politics. Oppositions are in an invidious position: release their popular policies too soon and the government will shame-facedly steal them or come up with alternatives; hold them back and be criticised for not having ideas – or be accused of having secret agendas. There is, additionally, much evidence that the verdict of voters is retrospective, punishing or rewarding the incumbent, leading the opposition to win or lose by default. This gives rise to another rule of thumb, that “oppositions don’t win elections, governments lose them,” which would suggest it doesn’t much matter what Labour says at this stage. Politics is a complicated business, and those commentating on it should remember that every piece of folk wisdom out there has led their predecessors astray at some point. This does not, however, mean that politics is too chaotic to make any meaningful predictions at all. Rather, it suggests pundits would do well to consider a wider range of evidence from outside the bubble, and view the conventional wisdom of their peers in the Village with a more sceptical eye.